Some Squarespace templates have a built-in sidebar feature. There are two types of sidebars: content sidebars for blogs and navigation sidebars. Both types are quite well developed, however, the number of templates with this feature is very limited. If you decide to choose a template with a sidebar option read this article to know how to configure sidebars. But what if you are keen on using a template that doesn’t feature a sidebar option (f.ex., our favourite Brine family)? We are happy to let you know that there are 2 ways to create a sidebar for blog page(s) on any Squarespace site. 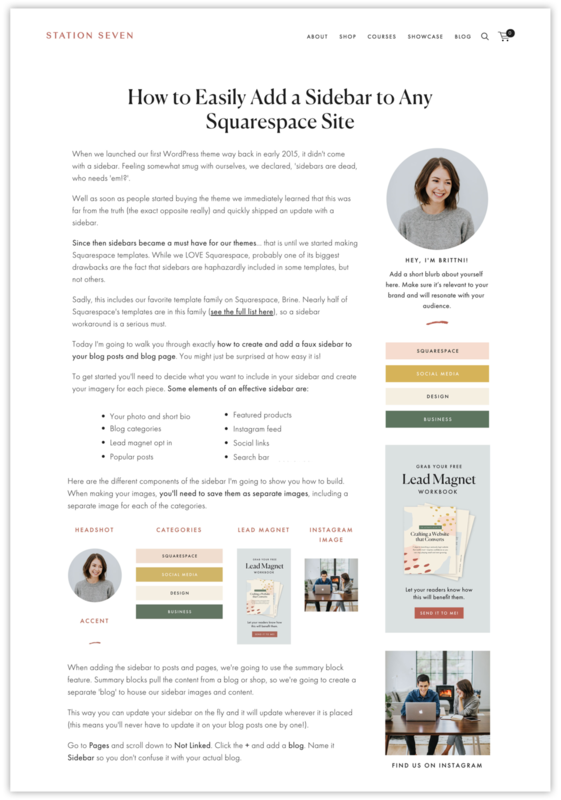 If you would like to add a sidebar to your Squarespace blog - this plugin by SqspThemes is for you. You will need to create a page specifically for your sidebar content - and the plugin will display it as a sidebar on your blog page(s). Once you download the plugin, you will be able to customise the sidebar width, position, margins and colours. If you have multiple blogs on your Squarespace site you can create different sidebar pages for each of them. The best part about this plugin is how easy it is to set up. If you feel uncomfortable configuring plugin yourself or need further customisation, Relativist Space is happy to offer website support services on an hourly basis. Please feel free to get in touch with our professionals who will install and customise the plugin according to your needs within the next 48 hours. Guys from Station Seven found a nice way of how to create and add a faux sidebar to blog posts and blog pages using a summary block feature. Check their article where they explain the process step by step. We think that this workaround is really smart and will work well if you have some graphic design skills to create some lovely PNGs for the sidebar content. If you have any questions or tips you can share, let us know in the comments below!